Snow Leopards are known for their beautiful coats, and are in fact hunted for them. They also have long tails for a cat their size. they also have the ability to make huge leaps. It is also amazing at how adapted they are to their environment and how equipped they are to deal with the harsh colds they face up in the mountains. They are also live solitary lives (except in mating season) and manage to survive all on their own. Because of all the hunting, snow leopards are on the endangered species list. 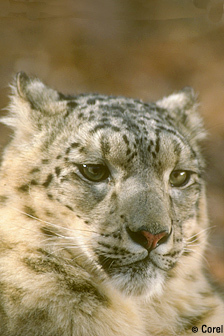 The snow leopard has thick grey fur with black rings on it. It has markings which help it to camouflage it from its prey. It's big paws act as snow shoes. They are 2ft. high(to the shoulders). They are 6 - 7.5ft. long, including their 40in. tail. They weigh from 77 - 121lbs. the females are about 30% smaller than the males but they look very similar besides that. It's thick hair helps it stay warm in the cold mountains. They have powerful lungs and a large chest capacity to help get enough oxygen in the high altitudes. Their enlarged nasal cavity helps warm the air before it goes to the lungs. The males head is usually wider and squarer than the females. It's long furry tail helps it balance over cliffs and it will wrap its tale over its body to keep its face warm. It makes noises just like other big cats, it can meow, hiss, growl, but it cannot roar. They are illegally hunted for their coats. They're coats are sought after in Central Asia, Eastern Europe, and Russia. Their bones and body parts are used for Asian medicine. The mating season is between January and mid-March. They live solitary and only pair in the mating season. The females raise the cubs on their own. The females are pregnant for 93 - 110 days. They usually give birth in June or July. The female usually find a cave and cover it with their fur. There are usually around 2-3 born in a litter. In captivity they can have up to 7. In the wild it would be hard for the mother to feed more than 3. The small cubs are helpless and don't open their eyes til they are 7 days old. They will survive on their mothers milk til they are 2 months old when they can eat their fist solid food. Then at 3 months old they will start learning how to hunt by follow the mother on her hunts. The cubs will leave their mother and go off on their own when they are between 18 and 22 months. The Females will be ready to mate by the age of 2, but for the males it takes longer. The males won't be ready to mater til they are 4. The Females will mate only every other year, so they can raise their cubs. They live up to 15 years in the wild but in captivity they live up to 20 years. The snow leopard is an endangered species, but even though hunting them is illegal they are still hunted for their beautiful coats. There is an estimated 4,000 - 7,000 left in the wild. They are not dangerous to humans but they have been known to occasionally attack livestock when their food is scarce. It eats goats, deer, sheep, or smaller things like rodents hares, or birds or whatever it can find. It can kill animals 3 times it's size. It lives in the high rocky cliffs because this lets it have a good view of its prey and gives it a good angle to jump from. It will spring at its prey from up to 30 ft. away. They are a very shy in the wild and rarely seen. They live in the mountains of central Asia, usually found between 9,800 - 17,000 ft above sea level. They are mostly active at dawn and dusk, called a crepuscular activity pattern. They are the national symbol of Tatars and Kazakhs[http:en.wikipedia.org/wiki/Snow_Leopard]. 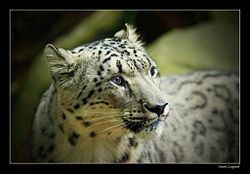 The Wakhi people of Northern Pakistan, China, Tajikistan and Afghanistan believe that supernatural beings can assume animal shapes, such as a snow leopard. This is a myth of the Wakhi people about a mergichan(supernatural being) that assumed the shape of a snow leopard and became a spirit partner of a Wakhi man. While the Wakhi man was sleeping he dreamt that a horse bit his leg. He woke up and found that a snow leopard was sitting on top of him. The snow leopard had bitten his leg. The snow leopard left, but came again and eventually became the man's companion. The Wakhi man believed that the mergichan of the snow leopard spoke to him in dreams to help him go to the right places to hunt for game. The snow leopard was his companion until the man died. Mammals: Snow Leopard San Diego Zoo. Snow Leopard Defenders of Wildlife. Cat Facts Snow Leopard Trust. Snow Leopard Conservancy Snow Leopard Conservancy. This page was last modified on 5 December 2008, at 20:09.